Designers are using materials for unique and practical design solutions. Too often confined to the role of decoration, textiles can offer comfort, protection, and much more. The wide-ranging use of textiles in architecture and design has a rich and ancient history. Though difficult to find early examples, due to their perishability, the oldest known survivor is a fragment of pile carpet from the 4th or 5th century BC. Structure, engineering; these may not be the first words that come to mind when considering textiles, but their flexibility - literally - surely resonates. Flexibility for use, flexibilty for design and flexibility for change. "The beauty of textiles is that they're something you can change," says Nancy Webster, practicum professor at the North Carolina State University College of Textiles. "We don't change structure too often. With textiles you can redecorate every 10 years, every two, or seasonally." Part of my research for a story about coffee cake, this is one of the first photos I ever took with my new...phone. Wowza. It's better than my camera. I'm not sure how to feel about that. Hostess Brands filed for bankruptcy protection in January for the second time in seven years. The move once again endangered New York’s long love affair with Hostess-owned Drake’s Coffee Cake, which started in the late 1880s, when commercial production of coffee cakes began in Brooklyn with bakers Newman E. Drake and William Entenmann. They were most likely called crumb cakes at the time (for the crumbly, streusel top), or tea cakes (we were mostly tea drinkers then), and they probably had names from Germany and Austro-Hungary as well. But whatever you call it, the sweet, cakelike bread was in NYC before anywhere else in the country. And it’ll continue to live on here, no matter what happens to Drake’s, thanks to a slew of updated versions of the classic. Read full story: NYPost: Cake quake! 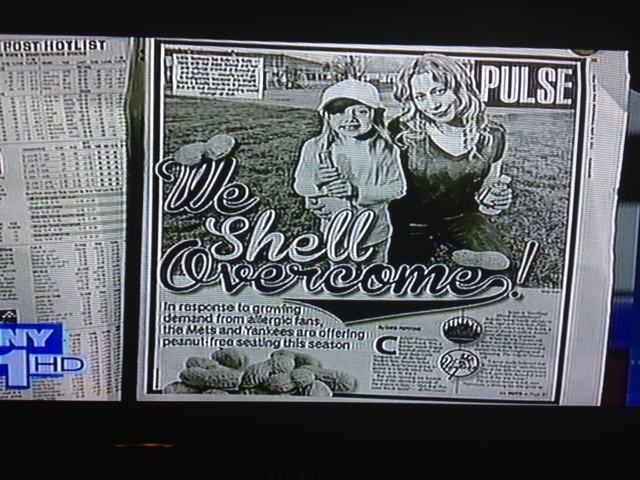 Peanuts at Mets, Yankees games: We Shell Overcome!